On Tuesday, April 11, 2017, the Grand Rapids City Commission meeting at 7 p.m. was packed to overflowing with people sitting in the aisles, standing in the corners and spilling out into the hallway. Concerns over cuts to housing funding and a recent police stop drew the crowd. 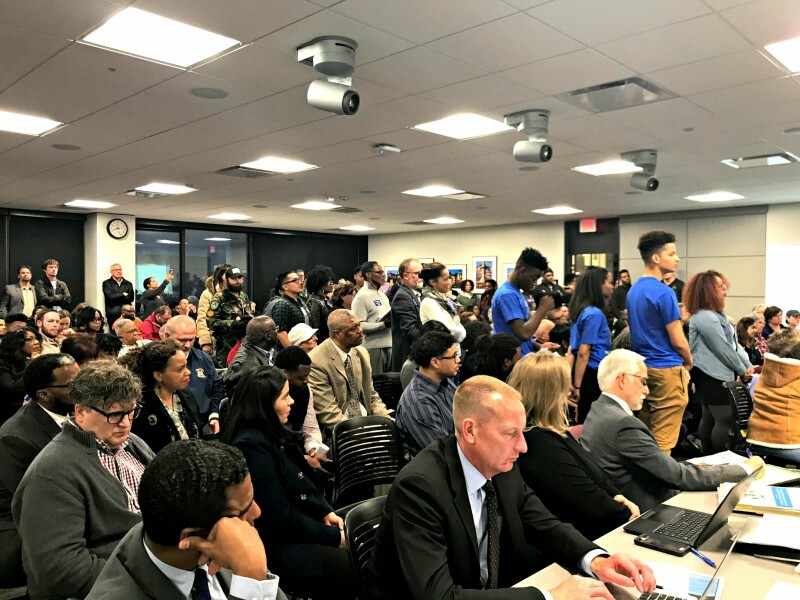 On Tuesday, April 11, 2017, the Grand Rapids City Commission meeting at 7 p.m. was packed to overflowing with people sitting in the aisles, standing in the corners and spilling out into the hallway. 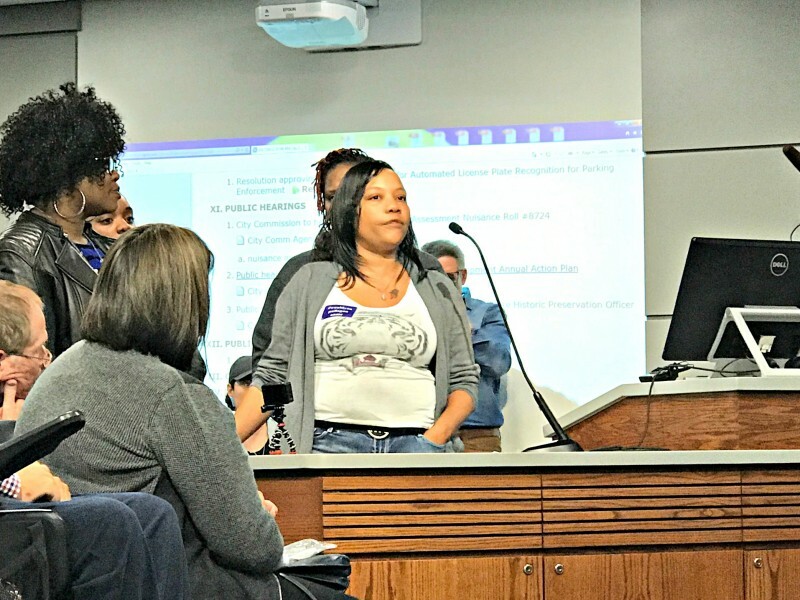 Concerns over cuts to housing funding and a recent police stop in which the Grand Rapids Police Department held five boys at gunpoint drew the crowd. Mayor Rosalynn Bliss, noting the numbers, started the City Commission meeting welcoming first time attendees and walked through the meeting's rules and order. Other business included Commissioner Ruth Kelly announcing a public hearing concerning new parking technology to be held at the next City Commission meeting April 25, 2017, and a public hearing on the Special Assessment Nuisance Rule, number 8724, including appeals and comments from City Assessor, Scott Engerson. The second public hearing on Fiscal Year 2018 Housing and Community Development Action Place brought several local non-profit organizations forward recommending their programs continue to be financially supported by the City. Concern over cuts to housing funding federally has prompted local organizations to plead their case with the City in order to continue their work. The Salvation Army, Community Rebuilders, Hispanic Center of Western Michigan, Job Start, Disability Advocates, the Fair Housing Center were among them. "Today I just got a call from the Department of Justice. They just finished a yearlong investigation of a complaint we sent them regarding a man who was a landlord and would prey on vulnerable women and would take alternative forms of payment for rent. The Justice Department over a yearlong investigation found substantial evidence and they notified the defendant it will be the United States of America versus this man. He owns and manages more than 20 properties in the City of Grand Rapids. This is just one small example of what we do," said Nancy Haynes, Executive Director of the Fair Housing Center. When the time for public comment was opened, a long line formed in the center aisle. Jeremy DeRoo, Executive Director of LINC UP, Cle Jackson, President of the Greater Grand Rapids NAACP and Robert S. Womack, Kent County Commissioner started off the public comments calling for the GRPD to significantly address racialized outcomes in Grand Rapids policing and a personal apology from the officers involved. Later, the three mothers of the boys, stood up together, holding hands and supporting one another while commenting at the podium. First IKeshia Quinn spoke. "I’m one of the mothers of this incident that happened to our boys. On March 24, that’s when our lives are changed. Our boys and the other mothers, we’re not asking for much. We just want our boys to get apologized to and get back to normal." Quinn added, "My son said to me, 'Why did they do this to us? Did we do anything wrong?' I said 'No son, you didn’t do anything wrong, you did everything right that you’re supposed to do.' We taught our boys to be respectful. My boys don’t have a father figure in their life. They play basketball, they play football all year long, I keep them active. For something like this to happen to them in the streets when they’re just walking down the streets going home..."
Moore added, "We can’t stop thinking of the fact, like someone else mentioned tonight in this meeting, what if one of our babies had made the wrong move and they wouldn’t be here with us tonight? Would you be okay with saying that it’s proper protocol then? Would you be okay with not apologizing, just dealing with what’s going on? The way this has torn up our homes, our happiness, our boys’ happiness, we didn’t have these type of worries before this happened. So we’re trying to get through it. And that’s all we ask, is for something to be changed. We don’t want this to happen to no other child. Not only our boys, we don’t only for our boys, we stand for all you guys and we don’t want this to happen to nobody else period." Jacquetta Sims, mother of two of the boys, also spoke. "I just want to say thank you to everyone who spoke here on our behalf today. We’re healing, but I’m not gonna lie, it opened up a lot of wounds for me tonight. I didn’t expect it to be like this. Miss Senita I thank you. I thank everybody else." Altogether, 43 people stood up to comment about the Grand Rapids Police Department drawing guns on boys aged 12 to 14 years, all in support of the families, calling for a direct apology from the police officers involved and for changes in police protocol so this type of incident would not happen again. In addition to the mothers other family members including a father, aunt, and grandmother all spoke out. Members of LINC UP, Equity PAC, the Micah Center and spoke in support of the families and police protocol reforms. 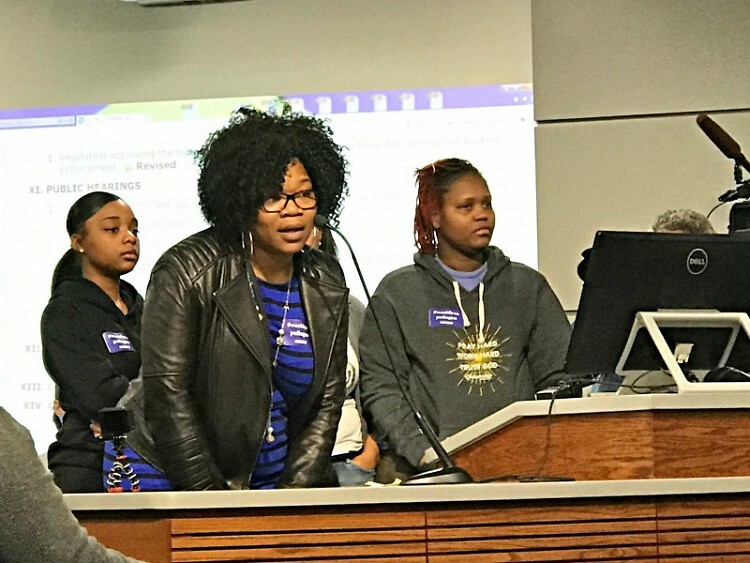 There were also comments by a local psychiatrist, one of the boys' basketball coaches, a local Mexican store owner, community organizers, and several students from the Grand Rapids Public Schools. The students and some others specifically asked "Would you pull a gun on me?" to the police department and wore stickers with the hashtag #wouldyoupullagunonme. Commissioner Joe Jones noted that it was hard to sit and listen without being able to reply and said, "I want you to know that I heard you and more importantly, I see you." Commissioner Senita Lenear noted that 43 people had all come up asking for the same thing. She said, "I don't want to be a part of inequitable solutions. I have a son and I don't want to be in a position to have someone draw a gun on him." Commissioners Ruth Kelly and David Allen also thanked the families and expressed concern. Mayor Bliss reaffirmed the City's commitment to systemic change and her commitment to see that happen, noting, "We are in this together." Commissioners Jon O'Connor, Dave Shaffer and City Manager Greg Sundstrom made no comments.